This is one of the reasons why I don't update my blog as often as other "normal" bloggers! 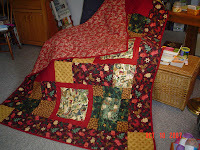 Even though this quilt did not take that long to make, sewing and quilting do occupy a lot of my personal time. 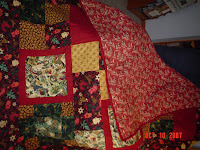 This quilt is part of the Thimbleberries "Count Down to Christmas" series. It basically is a twin size quilt. I finished the binding this past weekend and was extremely pleased that the binding went on so nicely and looked pretty good, for only my second quilt of this size that I have completed. It is a flannel quilt and quite warm. 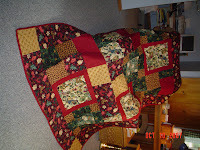 Melissa Johnson of "Seams Like Home" quilt shop did the machine quilting on this quilt. I plan to donate it to the guardian ad litem conference next month to use in their silent auction. Super Cute mom! I love it. Hope it raises lots of money.